Build a simple Xataface application. For information about using the web-based installation tool, see this 4-minute video tutorial on creating a blog with Xataface. For a more succinct tutorial on creating an application manually, see "At A Glance: Your First App" or "How to write a PHP/MySQL Application with 4 lines of Code". 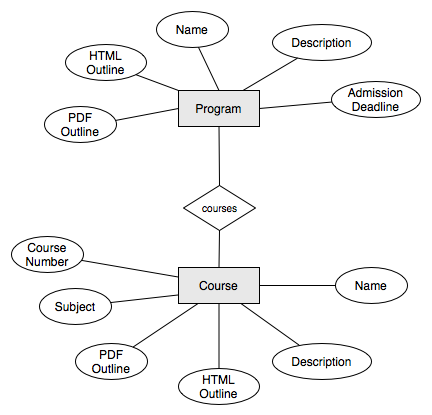 As the ERD shows, our database will need 2 tables (Course and Program). Our next step is to build this database. You can use any MySQL database administration tool to builld the database. My personal tool of choice is PHPMyAdmin. The following steps describe the procedure for creating this database using PHPMyAdmin. The database has been created with 2 tables: Program and Course. We can now move on to building the Xataface application. Our Xataface application will provide a user-friendly front-end to our database. A basic application consists of a directory with a configuration file and an entry page (PHP file). Xataface comes with a PHP setup script (called makesite) to create the skeleton for your application. Alternatively you can set up the application manually. Note: For the following instructions and examples, my Daface installation is located at /Users/shannah/Sites/dataface and the URL for the installation is http://localhost/~shannah/dataface. From the command prompt, navigate to the dataface directory. (in my case /Users/shannah/Sites/dataface). <site_path> = The path (absolute or relative) to your application directory. <db_host> = The MySQL host name. <db_name> = The name of the mysql database for the application. to connect to the database is root and his password is password. You may be wondering what these files. Here is the short version (Read the next section "Creating applications manually" for more detailed information about the contents of these files. The index.php file is the entry point for your application (i.e., you point the web browser at this file to use the application. The conf.ini file contains database connection settings and some other minor settings, like what should appear in the navigation menu. The tables/Program (tables/Course) directory can contain configuration files specific to the Program (Course) table. More on that later. Your application is now created. It will enable you to add, edit, delete, and find records in either the Course table or the Program table. There will be more on the basics of using this application in the next section. Note: It is very important that you block access to your conf.ini file as it contains sensitive configuration information about your database. The makesite script generates an .htaccess file to do this automatically if you are using Apache web server. If you are using a different server, you may need to use a different method for blocking access to these files. IIS users should add a Web.config file (if it hasn't been generated by the installer) to block access to all .ini files. You can download a sample file to do this here. 1. __FILE__ - Always pass __FILE__ in here. That tells xataface where your application directory is. There are 2 sections in this INI file: '_database', and '_tables'. The '_database' section specifies the database connection information for the MySQL database. The '_tables' section specifies which tables will be included in the navigation menu for the application. Note: If you are not using Apache, then you'll need to use a different mechanism for blocking access to your .ini files. E.g. On IIS (Microsoft Internet Information Server) you would need to include a Web.config file. You can download a sample Web.config file here. Note, however, that there is also an .htaccess file that is hidden from this image. You may be wondering why there is no 'tables' directory like the directory structure that was generated by the makesite script. The 'tables' directory is not required for the application to be functional. It will be required later on when we start to decorate the database. If things didn't go as planned, and you are running into trouble, please check out the the Troubleshooting page of the wiki for guidance. Download the source files for this application at a tar.gz archive. These files reflect the state of the application at this point of the tutorial. As later sections make changes to the application you will be able to download those versions also.